Education Secretary Michael Russell has rounded on Holyrood’s opposition parties after they criticised the authorising of a loan of £180,000 to the company in charge of organising ‘The Gathering’, the showpiece event at the centre of The Homecoming celebrations. 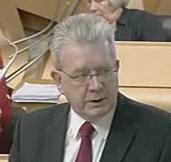 Mr Russell explained that the quick intervention of the SNP government had safeguarded 288 jobs. Mr Russell, who was minister for culture at the time of the loan, argued that the loan was essential to ensure the event took place and that the consequences of not supporting the company at the time would have been “catastrophic” for Scottish tourism. The Gathering generated £8.8 million for the city of Edinburgh and £10.4 million for the wider Scottish economy. However many small businesses were left out of pocket when the company in receipt of the loan went bust later that year. Mr Russell ridiculed claims that the short term loan had been kept secret by confirming that officials from Event Scotland had been made fully aware of the loan. Mr Russell also explained that there were matters of commercial confidentiality that had to be adhered to due to the recipient being a private company but the loan had been made in the appropriate way. Mr Russell added that he regretted the many attempts to tarnish the Homecoming and that some members of the chamber had shown a “grudging, curmudgeonly attitude towards the gathering and the homecoming”.